IBM is developing the world's smallest computer. 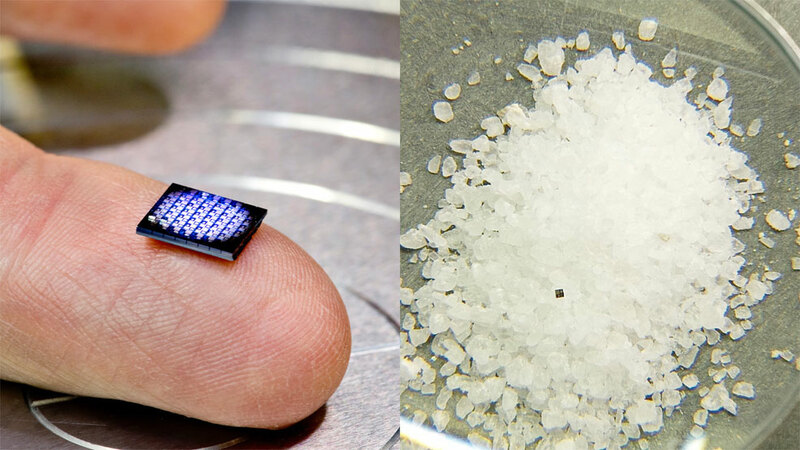 This machine [pictured right] will be smaller than a grain of salt, but more powerful than a computer from 1990 and with a total cost of less than 10¢. Even 64 of them together [see left] will still be smaller than the tip of your finger. Most people are familiar with Moore's Law, but few have heard of Bell's Law – a related phenomenon coined by U.S. engineer Gordon Bell. 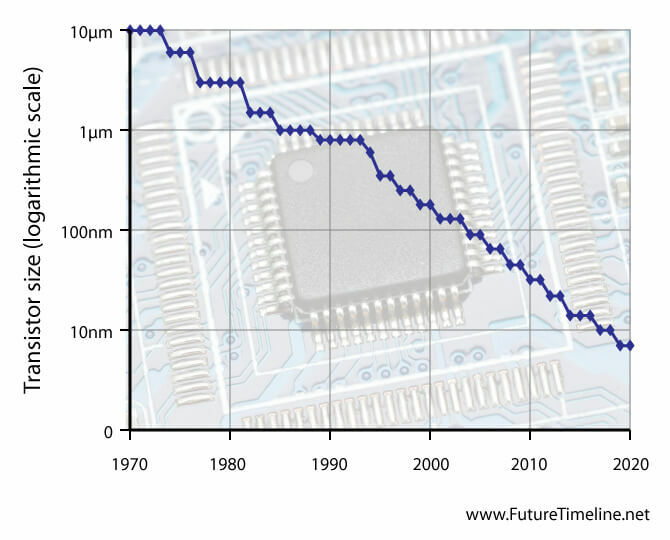 This describes how a new class of computing devices tends to emerge about every decade or so, each 100 times smaller than the last. The shrinking volume of machines becomes obvious when you look back at the history of technology. The 1960s, for example, were characterised by large mainframes that often filled entire rooms. The 1970s saw the adoption of "minicomputers" that were cheaper and smaller. Personal computing emerged in the early 1980s and laptops became popular in the 1990s. This was followed by mobile phones from the 2000s onwards, which themselves became ever thinner and more compact with each passing year, along with tablets and e-readers. More recently there has been rapid growth in wireless sensor networks that is giving birth to the Internet of Things (IoT). The new computer announced by IBM is just 1mm x 1mm across, making it the smallest machine of its kind to ever be developed. It will feature as many as a million transistors, a solar cell and communications module. The company predicts these devices will be in widespread use within five years, embedded in all manner of everyday objects. So-called "cryptographic anchors" and blockchain technology will ensure a product's authenticity – from its point of origin to the hands of the customer. These high-tech, miniature watermarks will (for example) verify that products have originated from the factory the distributor claims they are from, and are not counterfeits mixed in with genuine items. In some countries, nearly 70 percent of certain life-saving pharmaceuticals are counterfeit and the overall cost of fraud to the global economy is more than $600bn every year. This new generation of tiny computers will monitor, analyse, communicate and even act on data. "These [crypto-anchor] technologies pave the way for new solutions that tackle food safety, authenticity of manufactured components, genetically modified products, identification of counterfeit objects and provenance of luxury goods," says IBM research chief, Arvind Krishna. Looking further into the future – if Bell's Law continues – devices are likely to be small enough to fit inside blood cells within a few decades. The potential applications then will become like science fiction: could we see a merger between humans and machines?